We’re all about eating seasonal produce that is right at its peak of freshness and flavor. Lucky for us, May is all about grapefruit! Here in Southern California, local grapefruit trees are bursting with fruit and we can’t think of a better way to enjoy them than mixing them into delicious recipes. Our sweet tooth could be to blame for this one, but sometimes fruit tastes so much better in dessert form, right? And whenever we’re in the mood to bake, we immediately call in LaurenConrad.com resident baker Lauren Lowstan to help get our creative juices flowing. 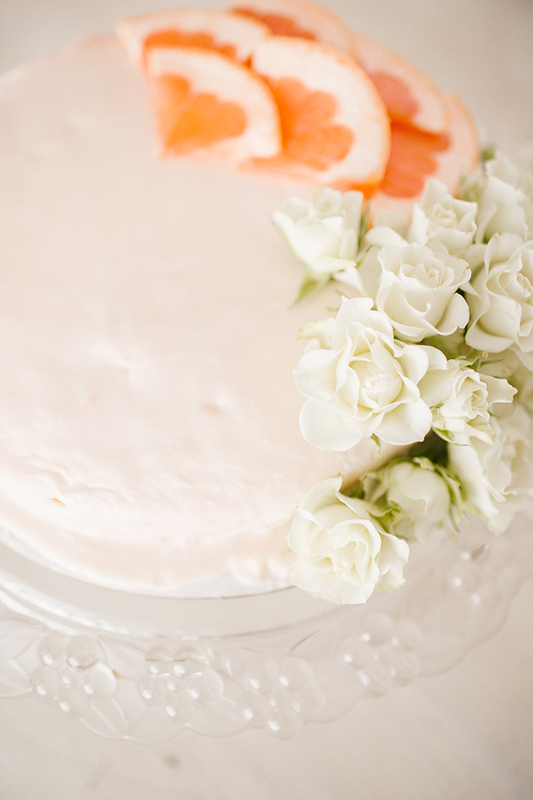 This month Lauren whipped up a grapefruit-infused cake, light enough for your next spring soiree. 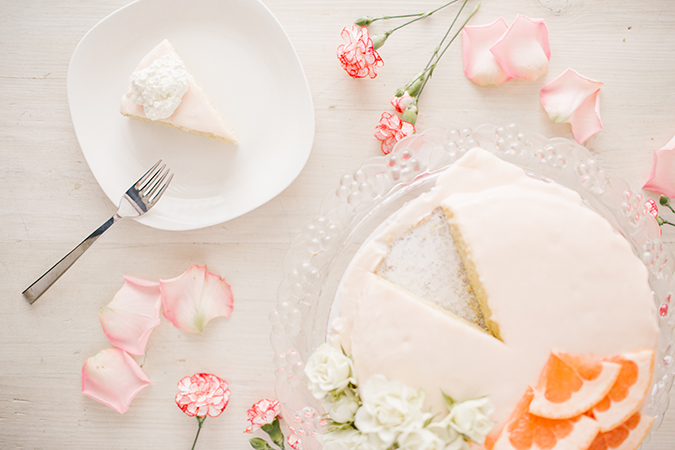 As if the flavor wasn’t enough to reel us in, this cake is served best with slices of fresh grapefruit and sweet flowers resting atop the homemade frosting. 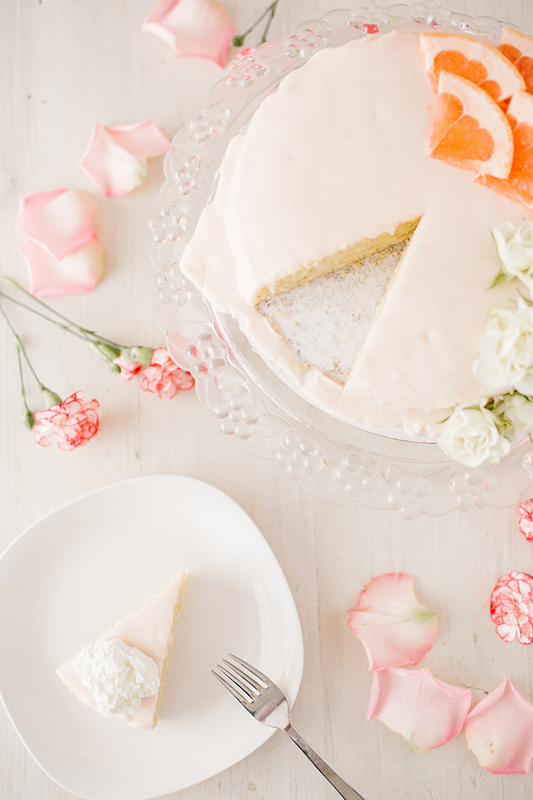 If you decide to recreate this grapefruit cake, you’re in for a real treat. Keep scrolling to snag the recipe and trust us when we say that your friends and family will be asking you to share it with them too! 1. Coat a 9-inch springform pan with cooking spray and set aside. 3. Whisk cake flour, almond flour, baking powder, baking soda, and salt together in a bowl. Set aside until ready to use. 4. In a stand mixer fitted with a whisk attachment, beat the eggs, grapefruit zest, and sugar until the mixture is thick, pale yellow, and doubled in size (about 3 minutes). 5. With the mixer on low, gradually add in olive oil and beat until incorporated. Add in the grapefruit juice and vanilla and mix just until combined. 6. Reduce the mixer speed and add dry ingredients. Mix just until there are no white streaks remaining. 7. Pour your batter into the springform pan and bake until the top of the cake is light brown and the center is firm to the touch (about 45 minutes). 8. Transfer the pan to a wire rack and let the cake cool in the pan for about 15 minutes. 9. Run a thin knife around the edges of the cake and remove the ring from the springform pan. Slide the cake onto a wire rack and let cool completely. 10. While the cake is cooling, make the glaze. 12. Drizzle cake with glaze and top with fresh florals and slice grapefruits. Enjoy! One slice is simply not enough! 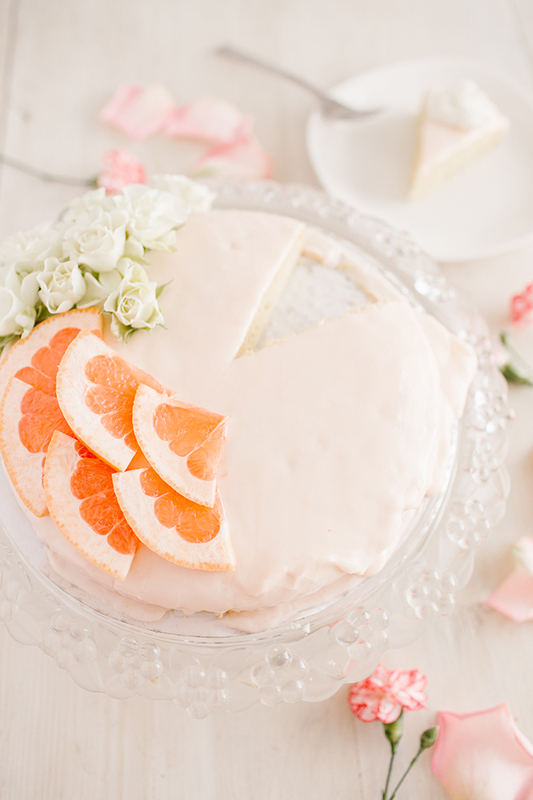 This grapefruit cake is the perfect centerpiece for any dessert table, that’s for sure. Will you be giving this recipe a try?